The Washington Executive Course is offered to senior compliance professionals of organizations, business units (hospital, health plan, region) or business lines (behavioral health, home care, hospice, commercial health plan, government health plan). The course is being held May 14 – 16, 2018 at the Health Ethics Trust HQ in Alexandria, Virginia. The Washington Course combines the best features of an interactive seminar with the content of an intensive course. You will be around the table with other experienced compliance professionals, while also getting the content of one of the Trust’s Certification Intensive Courses, which are comprehensive of compliance program practices and trends. 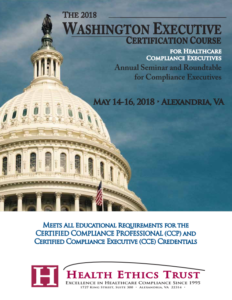 Those who complete the Washington Course satisfy all educational requirements to obtain or renew the Certified Compliance Executive (CCE) credential, the highest level credential in healthcare. Individuals may also attend to obtain or renew the Certified Compliance Professional (CCP) credential. The Washington Course will also carry credit towards HCCA credentials. The Washington Course is intended primarily for those who have achieved a basic level of compliance knowledge. Additionally, healthcare executives from other functions (such as HR, Audit, or IT) are welcome to attend. Board members attend at no charge when accompanied by their CO. Faculty for the program includes a nationally recognized group of compliance professionals. Keep track of faculty updates on the WEC page. Enroll today and enjoy a vendor-free learning environment as per Health Ethics Trust standard practice. Use your early enrollment coupon by entering EARLYBIRDWEC50 at checkout.